This past weekend, I had an opportunity to catch up with Tony as he shared stories from his Drew Estate Cigar Safari trip. It seems to me that there are some exciting things in the works down in Nicaragua. Stay on the lookout for pictures from Tony’s trip that should be posted in the near future….unless he decides to slack it, which is highly probable. Moya Ruiz Cigars is owned by Danny Moya & Nelson Ruiz. We are the second private label to come out of Erik Espinosa’s new factory “La Zona” in Esteli, Nicaragua. La Jugada means “The Play” or “Move” in spanish. Our ode to dominoes & poker! 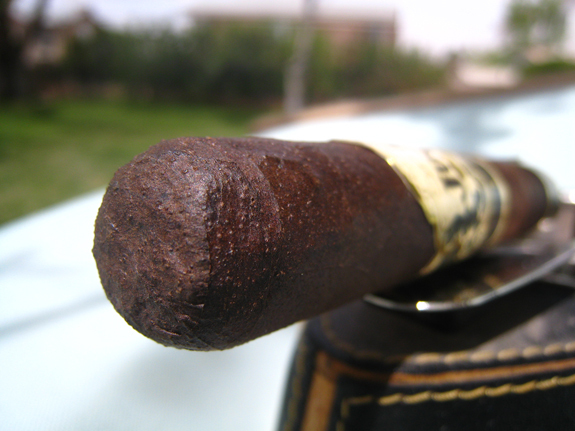 Prieto means dark in spanish because our first release is a maduro. 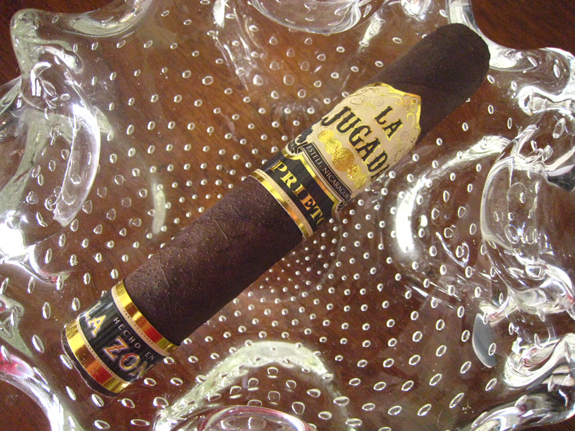 The La Jugada Prieto wears an oily Mexican San Andres Maduro wrapper that is dark brown with a deep red hue. The color is consistent from head to foot. I love how the bands look against the dark wrapper. If I saw this stick at a tobacconist, I would be drawn to it by the presentation. A fine tooth covers the wrapper and feels like fine sandpaper when touched. 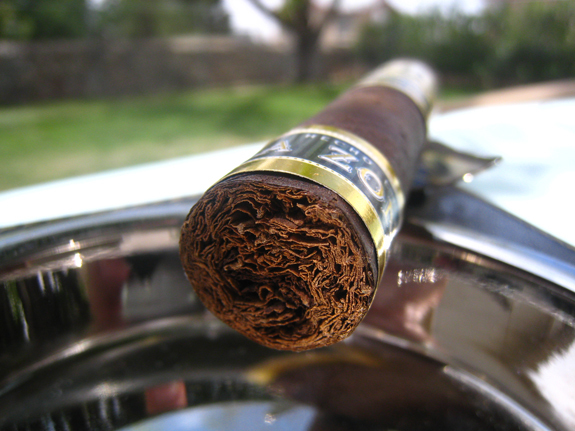 Mainly small veins are located on the cigar. The aroma off the wrapper is of manure, cocoa, and rich tobacco. A good amount of spice hits my nose off the foot of the cigar. With a quick clip, a free draw is revealed presenting notes of cinnamon, clove, and more rich tobacco. A spice lingers in my mouth after the cold draw, which makes me wonder if this is going to be a spice bomb. With the foot band removed, I begin my lighting ritual by toasting the foot of the cigar with my Zippo Z-Plus!. Right off the bat, I am presented with a rich profile of wood, cooking spices, and pepper. The woodsy notes are not the usual cedar but I am unable to identify it at this point. 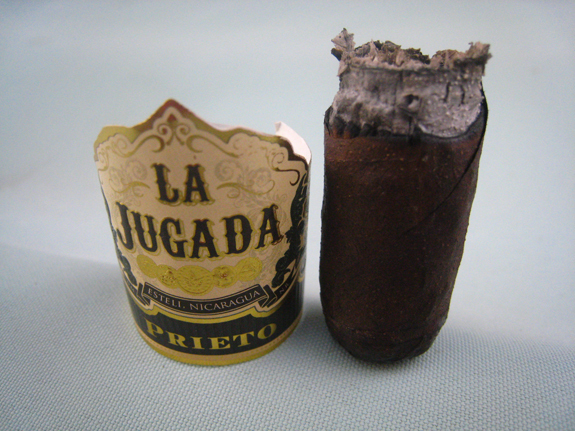 Due to the boldness of the flavors, I am a little hesitant to retrohale this La Jugada Prieto. The pepper and spice are in full force on the retrohale. I hope this clears out the little congestion I have left. About an inch in, the flavors have settled and balanced out. A chocolate finish is extremely enjoyable. Additionally, some sweetness has entered the mix. The burn line is thin with a slight wave but nothing of concern and the white, toothy ash held just short of an inch. The flavors are are full, while the strength is in the medium range and already moving up. 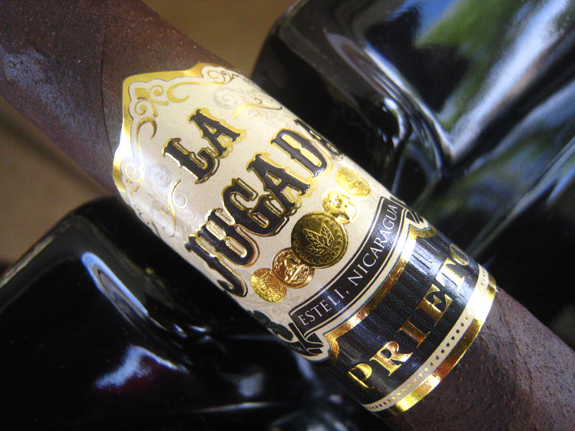 A copious amount of flavorful smoke is pouring out of the La Jugada Prieto. The chocolate notes, that were on the finish earlier, have entered the profile, along with some cinnamon and dark coffee. There is also a tanginess to the smoke that is intriguing. The ash is a little flaky but holding to about an inch. No change in the burn line so far. I am already approaching the large main band in the second third. With no issues, the band comes unglued. Flavors are still full and the strength is now equal to the flavors. As I enter into the last third, the flavors have become a bit toasty but remain rich. The smoke continues to deliver cinnamon, wood, and rich tobacco flavors. 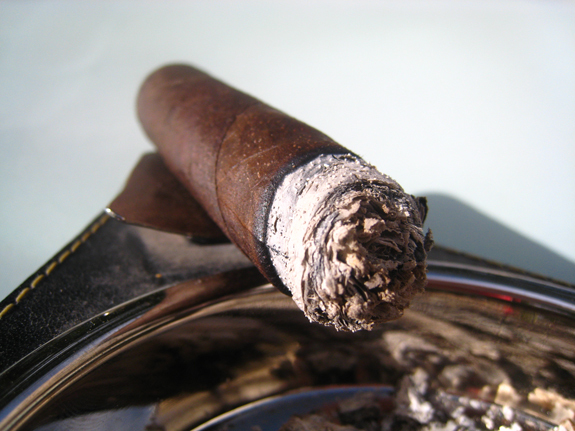 One side of the cigar is having trouble burning, which I quickly fix with a small touch-up. Whoa! I am starting to feel a good amount of nicotine. The final puffs remain satisfying with some sweet woodsy notes and chocolate. After an hour and half of smoke time, it is time for the La Jugada Prieto to be laid to rest. I need to congratulate Danny Moya and Nelson Ruiz for coming out with a solid smoke! 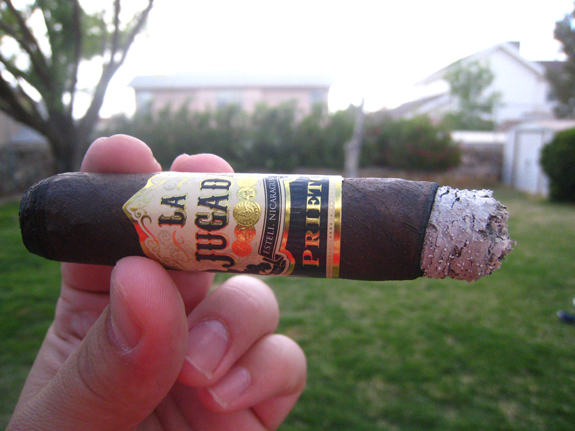 The La Jugada Prieto is everything that I enjoy in a cigar. 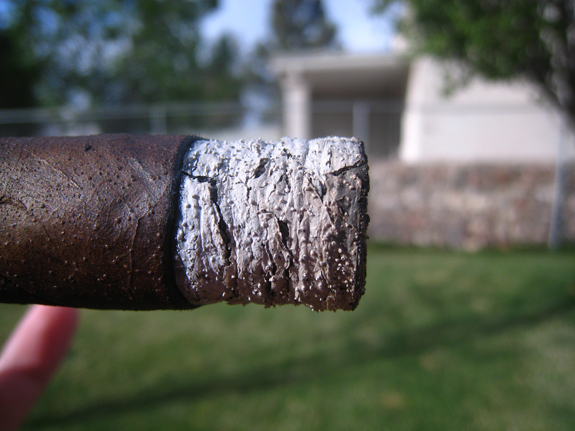 The flavors were full and complex, the construction excellent (only one small touch-up), and the ash was to par. The Robusto can be picked up at Smokeinn.com for $40.00 for a five pack. With price in consideration, the La Jugada is in the sweet spot and this cigars brings additional competition to the market. I absolutely love seeing small companies releasing exceptional cigars. Also, Mr. Moya was kind enough to let me know that a Habano blend will be out for the IPCPR 81st Annual Convention and International Trade Show. Sounds like a winner, although not for the faint of heart. Thanks; I hadn’t heard of this one berfore. I’ll have to look for a couple of singles to try out. Ive read that some of the 601s and Murcielagos are now coming out of La Zona, as well. Thanks for the update on the 601s and Murcielagos! Absolutely, try to get a hold of a couple. If you are a San Andres fan, you definitely need to try the La Jugada. Thanks for checking out the review!